Each woman dreams about an ideal figure, butnot everyone can brag of it. Therefore in fight against excess weight and cellulitis women should try a big set of different techniques. One of the most effective techniques isthe pressuretherapy.It is a unique technique of a figure correcting. Besides, it is extremely effective for elimination of hypostases, flabbiness of skin, in fight against varicosity. This therapy is more effective than manual massage (one procedure of the pressuretherapyis equal 10-15 usual manual massages). Usually such procedures are carried out by means of a special suit;however, it is possible to carry out local procedures, using only separate parts of such suit. It is important, that not each salon can offer similar services.Therefore, you still have a chance to be one of the few, who will be able to carry out such procedures. 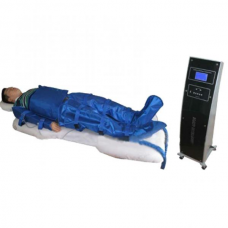 This model guarantees absolute safety of the client, besides it will allow feelingrelaxed and full of strength after such procedures. The device is equipped with steady power unit and has fourteen airbags.